Hello, lovelies~ I received a package the other day that kinda surprised me because I didn't remember ordering anything online. However, my memory was refreshed when I saw the shipper's name, Kawaii Beauty Japan. Thank you! Not gonna lie, I opened the package kinda like a savage who has been stranded on a desert island for weeks on end, lol. Anyway, it made my day when I saw the Bouncia label on the bottle. I rushed to the shower to give this baby a try and after a couple of showers, here are my thoughts on it. I received the 550 ml bottle with the pump, but you don't really need the bottle to create those bubbles. This doesn't have sodium laureth sulfate as the top 10 ingredients, which is notoriously known to dry out the skin like the sahara desert. In fact, it has hyaluronic acid, collagen and milk butter that is very moisturizing for the skin. Making those bubbles are easy and economical. All I need is a pump (or around a teaspoon) of soap poured onto a shower puff and voila~ Fluffy bubbles to accompany you in the shower. The scent is leaning towards that of a floral family, but it's not something that is very strong. The bubbles generated from Bouncia made my skin feel more moisturized that when I forgot to apply my body lotion, it's still moist. Usually, body wash that has lots of bubbles tend to dry out my skin, but this one doesn't. The glycerin is probably the one responsible for moisturizing my skin because of its ability to draw moisture from the environment. 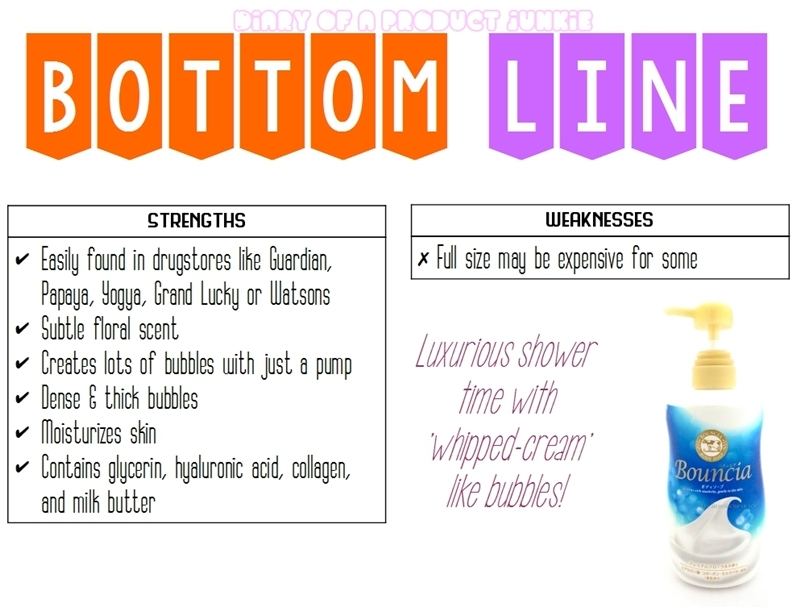 Overall, Bouncia soap kept their promises of luxurious bubbles during the shower and soft skin after shower. It really makes me look forward to my shower time because I can play with all those bubbles.